Enkei Valve Stem Seals - Miata Turbo Forum - Boost cars, acquire cats. Anyone have a source for replacement seals for Enkei metal valve stems? Mine sprung a leak and I'd like just just replace the seals instead of the whole assembly. We have the Enkei black valve stems here. 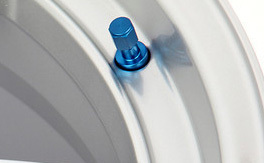 We have the Enkei Blue valve stems here. Drag Radials for stock 15's.